Did you know you can eat your way to beautiful and flawless skin? There is a strong connection between what you eat and how you look. With the right foods, you can even reduce signs of ageing like wrinkles, thickening, discoloration, and decreased elasticity. At the same time, eating proper foods helps keep you healthy from within. A healthy body will always reflect healthy skin. A balanced diet is an essential prescription for a healthy and vibrant skin. Foods that are high in antioxidants, such as vitamins A, C, and E, and selenium, help keep your skin well protected and nourished. 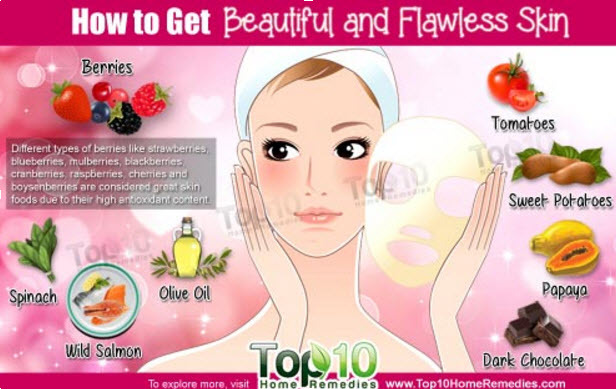 Here are the top 10 foods to get a beautiful and flawless skin.